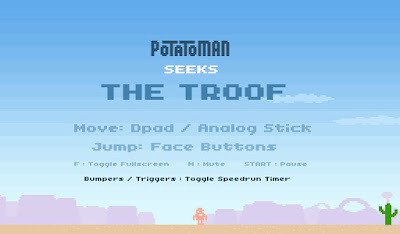 Potatoman Seeks the Troof is a minimalistic platformer. With a bit of randomness, use your platforming skills, memory, and reaction time to traverse a handful of levels moving just left or right and jumping. 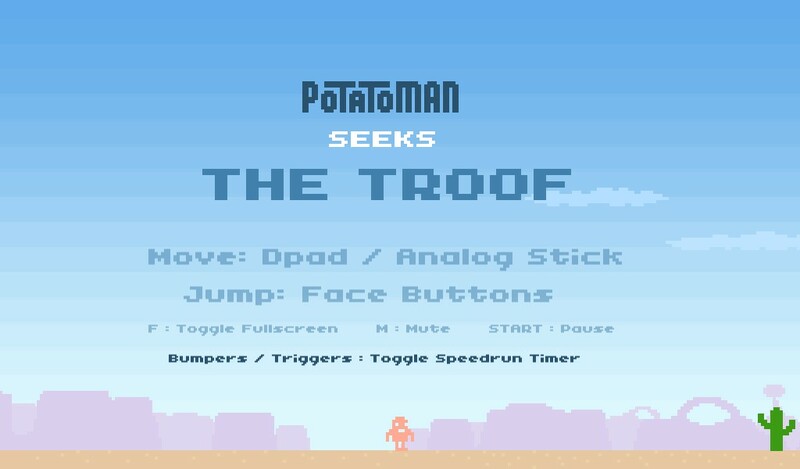 Looking through games with short 100% achievement times, I decided to play Potatoman Seeks the Troof. + Simple controls, yet challenging gameplay. - Short: My first attempt to beat the game took about an hour. After a couple of tries I was able to beat the game without using a continue. This game might be too simple and short of an experience to recommend as a purchase, yet its simplicity and shortness are also the reason I would recommend playing it. 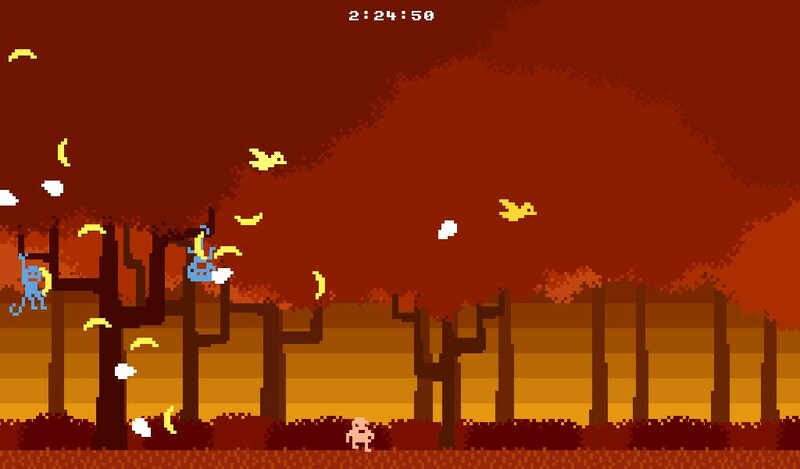 If its not already in your library, a version* of it is available to play on Kongregate.com: Potatoman Seeks the Troof. *The only difference I could distinguish was the final boulder section of the fourth level of the flash version seemed fixed (always the same sequence) whereas that of Steam version seemed to be randomly determined based on the player's inputs. Cowboy: Jump to dodge his bullet after passing him. Pair of cacti: Jump over both. Cactus: This cactus grows, jump over it. Tall Cactus: Jump over it. Cactus: Randomly hops left, straight up, or right. Walk under it and if it hops right add a jump. Cactus: Multiplies randomly. Walk under it, possibly pausing to dodge. Line of cacti: Hold Right and wait when the last cactus jumps, jump over it. Beginning: Mostly Hold Right, Dodging a Couple Eggs. Never jump (the chicks jump over you). Monkeys: Don't be so afraid of the bananas, because only some actually come towards you. Big eggs: You might lose time, but it's easier to stay mostly to their left, than be in the middle of them. Cars: two cars going in the opposite direction will crash. You can jump on a car, but can't be on it when it crashes. Sharks: Always come in the same grouping. Determine what works best. UFO: Walk back and forth under it. When the alien is done talking, it'll beam you up. Boulders: Go under the first big boulder. Jump over the small boulders onto the platform. Get onto the leftmost platform and follow the last boulder in a series. Jump to the next platform and stand in the sweet spot. When the gap occurs again, jump out of the area. Be careful for a stray boulder. Run right and when the lone rock is about to catch up to you then jump over it. Wait for the remaining rocks to fall and begin running right. Bats: Once you start running right then don't stop, bat formation is based on key input. I make one jump outdoors, one jump to get from outdoors into the cave, and a small jump (tap the jump button while pressing right) some time inside the cave. As mentioned, I keep running and the bats don't touch me. Finally, I'm not sure if its necessary, but if I die then I walk as far left as I can and get a running start. Large boulders: I find that two jumps before reaching the first boulder helps. It still feels quite randomly. Also if I die, then holding right from the start typically spawns a boulder right next to me, which is bad. Use plenty of pauses and small backsteps, but often hold right. Further down the path, there may be a point where you can always stop where the boulder lands/will land, wait for it to begin passing over you, and then continue holding right. There are shards to collect. Once you collect a shard, it will remain collected (this can be taken advantage by choosing a route which allows you to die and spawn at the right points in the stage). This sequence might be good: one near fake spikes, die, one at top right, move back left to top, die, one after spike wall, continue around that path to hit bottom and eventually top left. I suppose technically the top can be saved for after doing top left.